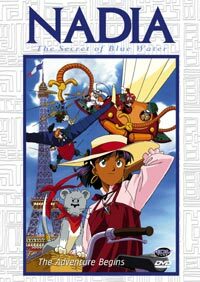 Despite the relative flaccidity of the above description, Nadia (an early-Nineties creation of the fun-lovers at Studio Gainax) is a lively adventure, swinging easily from gut-busting hilarity to thought-provoking importance, often within the same episode. There are some moments of heart-stopping suspense thrown into the mix, but overall the tone of the series is one of fast-paced action and humor. Probably the most notable feature of the series is its characters. Director Anno Hideaki (the same guy who was behind both Evangelion and KareKano) paces the series well, and gives EVERY character we meet time to develop. There are no cardboard cutouts in this series; every person, from Jean and Nadia to the mysterious villain Gargoyle, is three-dimensional, with a personality of their own. Most admirably, the jewel-thieving Grandis gang defy the stereotype of Smart But Looney Ringleader And Incompetent Henchmen; Grandis and her two helpers, the super-strong and arrogant Sanson and pudgy mechanical genius Hanson, manage not only to resonate as sympathetic characters, but each in their own way becomes a hero. Also of interest is the overall design. The Grandis gang's steam-powered minitank and the secretive submarine Nautilus both come from an inspired imagination (the series itself was based - very loosely - on the writings of Jules Verne), and the characters themselves are memorable for their distinctive looks as well as their personalities.